Official Samsung firmwares are easy to find on the web but difficult to download.Sammobile is a website for official samsung galaxy firmwares.It also has tutorials, reviews and news related to samsung mobiles.If you have accidentally made some software changes or have installed another unofficial rom for your mobile and want to revert back then you need to install a stock rom for your mobile.Stock roms are easy to find on the web but not easy to download as most servers give you limited speed to download with no resume capability.You can find stock firmware for your mobile on Sammobile.When you have selected your required rom it asks you to sign in to download.After you have registered and signed in it asks you to pay if you want to download with handsome speed but in the other case you get limited download speed which can take hours to download and you dont want that.You need to buy a premium account and upgrade your membership to enjoy perks of Sammobile.Sometimes you can get a premium sammobile account for free on bugmenot but the chances are extremely low.Today I am going to tell you how you can download samsung mobile firmwares directly with full speed using a tool called Samfirm and fix slow speed download.A developer from Xda Developers developed it to download firmwares with maximum speed from server. Let’s get started into the process.Firstly you need to download the latest version of Samfirm from the link below.There is no complicated process of installation.You just need to download, extract and run it directly.It is a portable program. 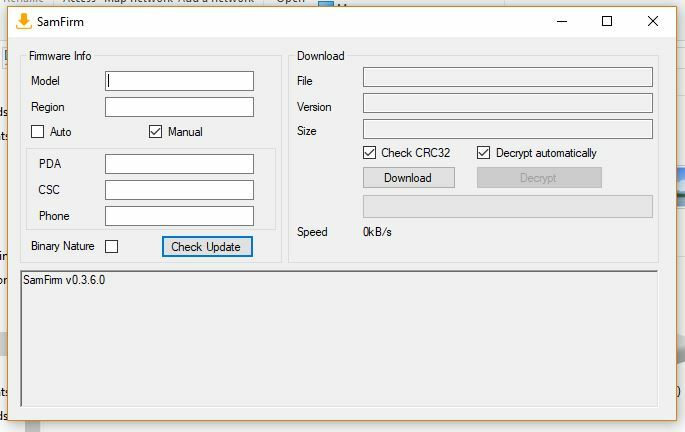 Now after you have downloaded Samfirm for downloading samsung firmwares in quick speed open it.The program will look like this. Here you have to specify your phone model and region and then click on Check Update. To find the region code for your country use the txt file in the samfirm archive. If you cannot download your desired rom by entering model and region then click on manual and copy paste pda,csc,phone from sammobile firmware page and then click on check update. It will automatically find the latest firmware for your samsung smartphone and show details in the next column.After that click download and it will ask your for the location where you want your rom to be saved.It will start downloading firmware with full speed directly from servers and save you tons of time.This is the only way to download firmware from sammobile with high speed, else you need to have a premium sammobile account to download with high speed and no restrictions. Here is proof of Samfirm downloading a original samsung firmware with full speed.I have a 4mb internet connection. After firmware is downloaded it will be decrypted automatically and then you can extract archive for a md5 or tar file.Now simply open Odin connect your phone with usb.Go download mode and simply flash it on your phone. Actually worked ! i was expecting a click bait ! … really thank you, i traveled across many websites to find a solution. Great Program. God bless you ! Still working today, S7 PEO. Thanks! How may I help you? You have specified PDA here only. Just specify Model & Region in software and use auto method.You will be able to download updated firmware of your samsung galaxy j2.